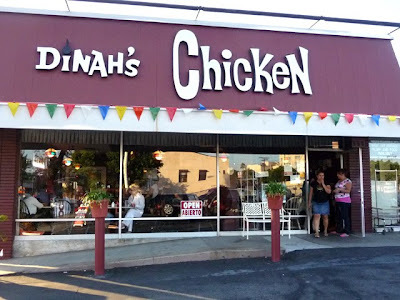 Dinah's Fried Chicken is free for local residents though August! Just show your California drivers' license or local I.D. for a free 2-piece dinner, and be sure to say you are a "new customer." Family owned and operated since 1967, this Chef ranks their bird among the best. You get this deal one time only. If you are near San Fernando Boulevard in Glendale swing by and get one. You have a choice of a side with a dinner roll. Mashed potatoes, macaroni salad, mac and cheese, and pineapple coleslaw are some side selections. 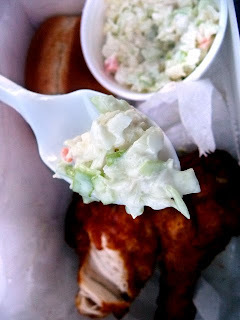 You can't go wrong with the coleslaw. Pineapple adds a sweetness to typical sour mayonnaise slaw. The dinner role is standard store-bought fare. But it is all about the chicken at Dinah's. Dinah's fried chicken has a subtle citrus flavored crust like orange marinated El Pollo Loco grilled chicken, a crispy dark brown fried batter that is less greasy than Kentucky Fried Chicken, and its white meat is as moist as roasted Zankou Chicken. 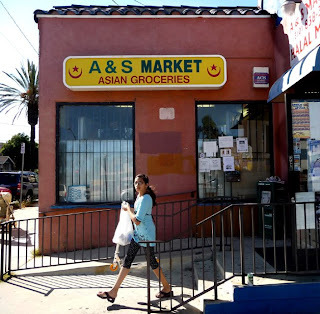 The 99 Cent Chef lived near Dinah's Fried Chicken in Glendale, Ca. for many years. 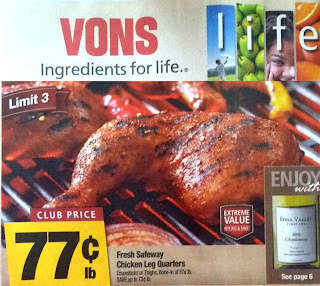 I cannot count the number of times I've had the pleasure of their poultry. I don't know why, but I like to order a two-piece dinner to go and sit in my car in the parking lot and eat. Am I too cheap to dine in and tip the waiter? Or is Public Radio playing a program on my car stereo too involving to walk away from? Actually, they do not sell beer but the market across from the parking lot does, and a perfect accompaniment to fried chicken is iced tea or beer. You can probably figure out which I prefer. 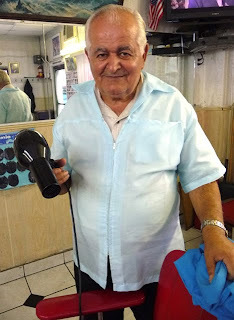 I no longer live near Dinah's but my Armenian barber does. I have been going to him for over a decade now. When you find one you like, as with a woman or a car mechanic, you stay with them forever. 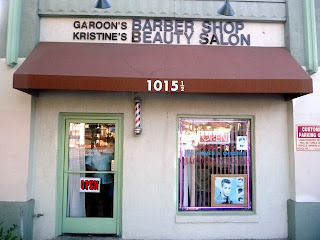 Garoon Barber Shop is in a mini-mall like Dinah's. There are two barbers, Garoon and Kachik. Both are excellent and speak very little English. I walk in, grab a magazine -- Garoon asks "short or medium," I shake my head yes and let him decide. Guys do not need to converse with their hairdessers; just give me a couple of barber shop men's magazines and I am happy (I am more of a Gourmet Magazine and The New Yorker subscriber, so reading GQ is a nice change of pace). And the price of a haircut is $10 including tip! They are quick and efficient, and local Armenian cable programs on the overhead TV give you an exotic ambiance. Women's hair is done next door at Kristine's Beauty Salon. They are open 7 days a week 9 AM - 7PM, and I always drop by Dinah's for fried chicken after my haircut. Hey guys, how many cooking blogs recommend dining and a haircut! You only have through this weekend for free chicken, but you have plenty of time to visit my friends Garoon and Kachik for a cheap shave and a trim. 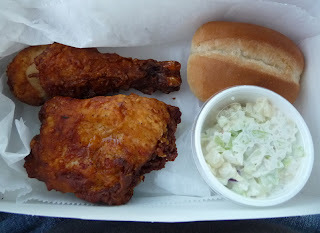 Dinah's Fried Chicken - Free through August for local new customers: two-piece dinner or substitutions of equal value. Dine-in or take-out. Hours: 11am - 9pm (dining room until 8:30pm). phone: 818) 247-7210. 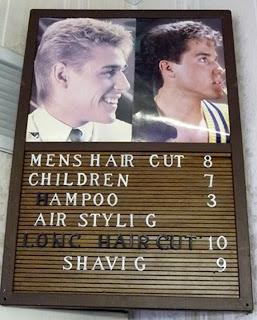 Haircuts are $8 for adults, $7 for children. 99 Thanks to Paul and Danit at L.A. Decostified for the free chicken meal heads-up! 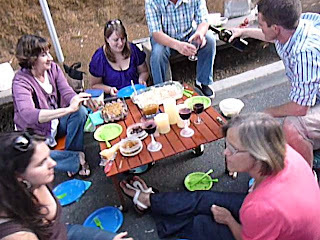 My vegetarian neighbors Ben and Lisa were kind enough to invite The 99 Cent Chef over for an outdoor birthday party for their five-year-old son, Justin. 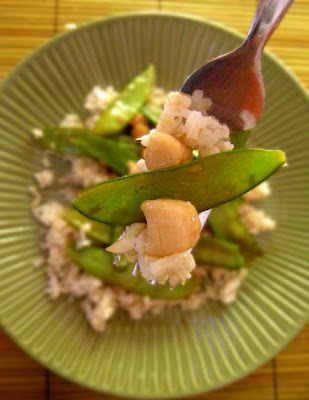 The Chef always makes it a point to pay attention to their menu to pass on any entree that his vegetarian readers may enjoy. One party entree included a tasty tomato sauced penne pasta salad, but the real stand-out was a Black Bean & Corn Salad. It was delicious, but needed a little work for my taste. 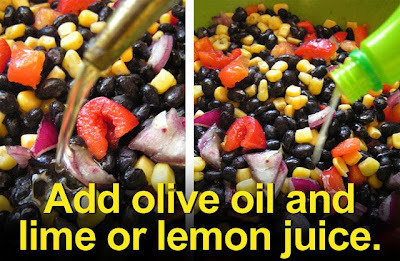 First, the black beans still had sauce, so the bright yellow corn was muddy looking, and the flavor was underwhelming - some citrus juice and olive oil was needed to brighten things up. Minor tweaks really, and just a matter of taste. 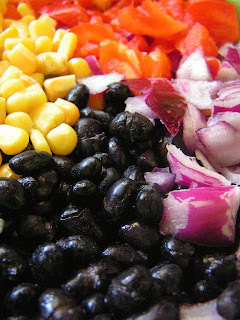 I am always looking for an excuse to use black beans (check out my Ceviche & Black Beans recipe) and corn is an excellent pairing. I originally tried using defrosted frozen corn, but kept biting into tough, raw kernels (but fresh corn is a different matter and would be fine -- just cut shuck, slice off kernels, and quick-blanch.) So for this recipe, I'm sticking with canned corn. 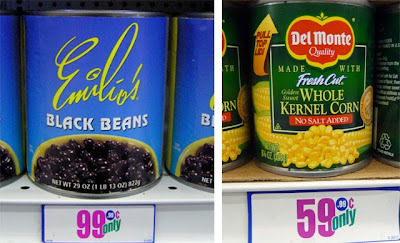 Corn and black beans are always on sale everywhere; I got mine from this 99c only Store. Fresh chopped sweet red bell pepper and red onion add more color, crunch and texture. 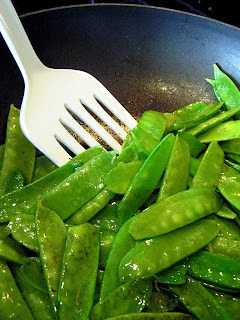 This is a fine and hearty side dish to serve at a picnic or party; just open a bag of tortilla chips to stretch it out. Pull out this recipe for your next barbecue -- it pairs well with chicken and fish. 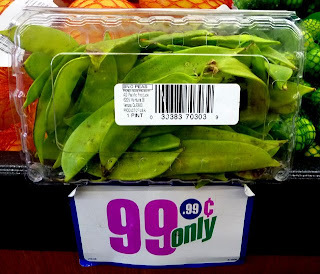 The 99 Cent Chef's Black Bean & Corn Salad is one quick, cheap and filling veggie accompaniment. Black Beans - large 1 1/2 lb. or 2 1/2 cups, rinsed and drained. Corn - Two 8 oz. cans or 2 cups, drained. 2 tbsp. lemon or lime juice - fresh squeezed or bottled, ok to substitute vinegar. Drain and rinse canned black beans, then place in a large bowl. Add drained corn. Chop bell pepper and onion. 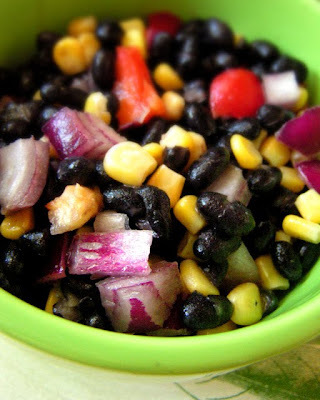 Mix into bowl of black beans and corn. Finally, blend in olive oil and lime or lemon juice. Salt and pepper to taste. 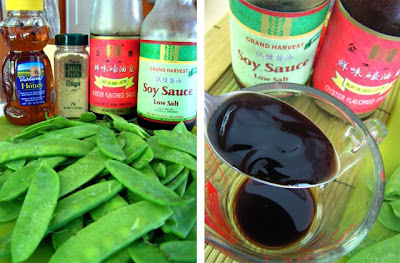 Allow to sit for half an hour to marinate at room temperature. Serve with tortilla chips or just as a side for your birthday party! Food lovers are celebrating Julia Child's birthday today. 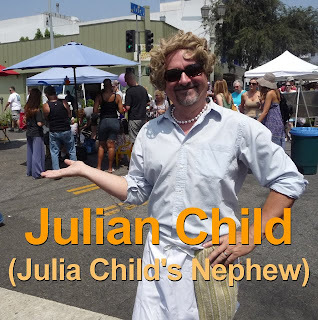 An in her honor the 99 Cent Chef's new palate-pleasing video, "Julian & Julia," introduces Julia Child's nephew, Julian Child. He's a real chip off the cutting board and a chef worthy of sauteing with Aunt Julia's copper-bottomed pot! I had the good fortune to run into Julian Child at the Hollywood Farmers Market this last Sunday. We chatted about his "Aunt Julia" and the movie "Julie & Julia." 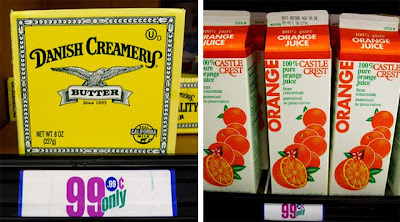 As we walked through fresh and fragrant stalls of produce Julian stopped at a stack of organic oranges and reminisced about his childhood summers in Paris, France, and how he would tug at Julia Child's apron and beg for his favorite dish: Crepe Suzette in an Orange Butter Sauce. Aunt Julia eventually grew tired of always preparing it and soon taught it to her nephew, a budding chef. 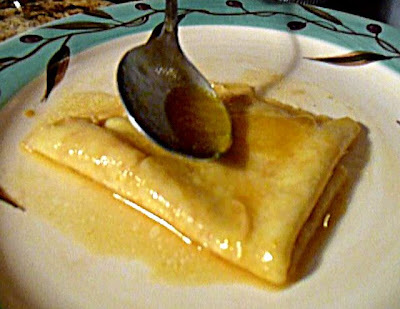 I seized the opportunity to invite Julian to The 99 Cent Chef's kitchen to cook his Aunt Julia's Crepe Suzette for everyone! Play it here. The video runs 6 minutes, 20 seconds. Click here to view or embed video from youtube. 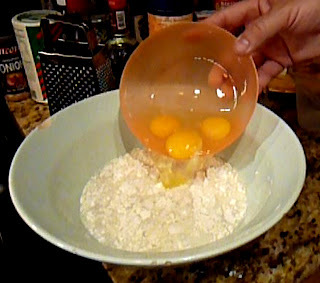 In a large bowl mix together flour, milk, water, salt, eggs and 1 tbsp. of melted or soft butter. Whisk until well blended, about 2 minutes. Heat your medium (about 8 inches) non-stick omelet pan and coat with 1 pat of butter or oil. When butter is melted, add 1/4 cup of crepe batter - enough to just cover the bottom of the pan. Hold up pan and swirl to coat pan evenly. It is better to have too much batter than too little - a thin crepe will tear when turning. Cook crepe for a minute, then loosen around the edges and continue cooking for another minute. Peek before turning to see if crepe is starting to brown. Carefully turn crepe over and cook for another half minute. As my video shows, the first crepe may stick and be unusable. Instead of throwing it away, you might as well taste it to see how tender the crepe turned out. Don't worry, it takes a couple of crepes to get it right. 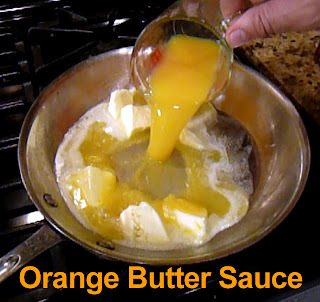 Your crepes may not be perfect, but with a sweet Orange Butter Sauce no one will be complaining about the appearance. Set aside your cooked crepes to add to the Orange Butter Sauce. Use a large enough pan to dip a whole crepe into. Melt butter, then add orange juice, zest and sugar into pan, over a medium/high heat. Cook until sauce is reduced by half and thickened, about 5 minutes. Reduce heat and add a crepe. Notice my use of a spoon and fork, in the video, to fold crepe into sauce. 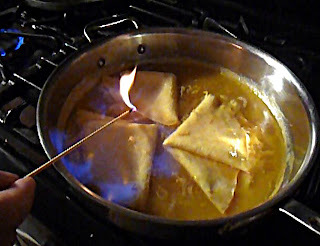 Fold in half once, then fold one more time and push crepe to the edge of the pan to make room for more. I managed to fit about 3 crepes at a time to my pan. Allow crepes to heat through for a minute. Now the fun part - cognac flambe! Have a long-handled match ready. This is when you want an audience. Your table should be set and the lights dimmed so you can serve the flaming Crepes Suzettes with a flourish! When sauce and crepes are warm, pour in half the cognac and bring to the table. Place before your dazzled guest and strike a match, lighting the sauce. Be careful: the cognac will flame up, so you don't want flammable items nearby (overhead curtains, paper, etc.) and your kids should not attempt this! Serve this first batch of crepes with a spoonful of sauce. Finish saucing the other crepes, then flambe, and repeat. Bon Appetit! If you are not familiar with the culinary icon, Julia Child, here is a scene from "Julie & Julia." Meryl Streep "chews" the scenery as larger-than-life Julia Child. The other half of the movie is about Julie Powell blogging and cooking her way through, in one year, "Mastering the Art of French Cooking" co-written by Julia Child. Both stories resonated with this Chef. And the movie's Paris locale is intoxicating. You will find yourself leaving the theater with the booming voice of Julia Child in your head and your utterances will have her cadence. She is so fun to mimic you cannot help but bellow "Bon Appetit" every chance you get! And 99 Thanks to Bob McGinness for his creative camerawork! 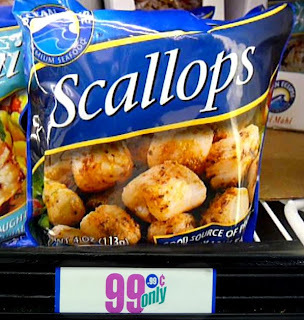 Sorry ladies, but The 99 Cent Chef is one cheap date -- just ask his wife! A favorite thrifty accompaniment to a beautiful sunset over the Hollywood Bowl is tender and succulent roasted bird from local legendary Lebanese poultry purveyor, Zankou Chicken. 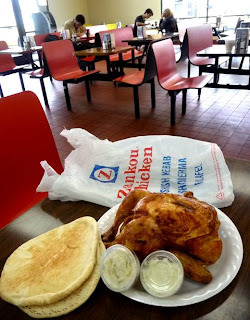 It's just shy of $10 dollars for a whole chicken -- that includes two pitas and two addictive and decadent garlic dips. I don't know the exact ingredients, but their garlic spread is so "crack" good you'll want to order a couple of extras (recipe here). Make sure to ask to have the chicken cut for easier eating. Usually I get a couple extra pitas for 25 cents each. Bring some sliced tomato, onion and avocado and you can assemble your own delicious roast chicken pitas (a large plastic container for the chicken keeps things less messy when dining on Hollywood Bowl benches). While satellite restaurants (really, just mini-mall formica settings) are popping up all over town, The Chef makes it a point to hit the Hollywood location, on Sunset and Normandie, a couple of times each summer during jaunts to Hollywood's musical mecca. This bargain night out is the best summer deal in town. And you can bring your own picnic (some lease event nights exempted); just notice all the various spreads on the walk to your cheap seats -- everything from crusty baguette sandwiches from Patina and salads from Whole Foods to bottles of Trader Joe's "Two Buck Chuck" Chardonnay. Were else can you wine and dine enveloped in beautiful sunsets, listening to a full orchestra playing to a star-studded Broadway-quality performance of "Guys and Dolls" for 10 bucks! What a relief not having to budget in $9 watery draft beer or $8 soggy-bun hot dogs. As for the "V,W, Z" cheap seats, yeah, it's a long way off, and your ears may "pop" on the way up. There are large projection screens, but I go to listen to the music, not to watch the show! The Hollywood Bowl acoustics are excellent anywhere you plant yourself. Now parking is not cheap, upwards of $15-$30 bucks for "stacked parking", but you can take a "park & ride" bus or park at Hollywood/Highland and take a shuttle for a few bucks. 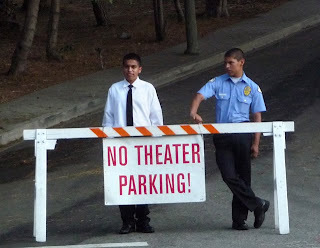 The Hollywood Bowl's website gives you excellent parking tips. The Chef used to live in off Franklin Ave. in Hollywood, so he knows a few side streets that are not restricted for free parking -- although it can be a long trek when loaded down with ice-packed chilled bottles of wine and other provisions. 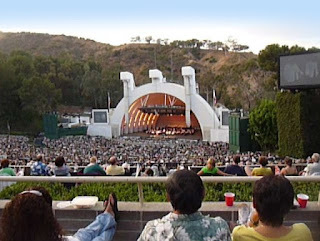 During these mild warm nights, August is the best month for a Hollywood Bowl picnic. So come along for a date with The 99 Cent Chef. His new video shepherds you down L.A. thoroughfares into Hollywood's Zankou Chicken Restaurant, then speeds through Hollywood backstreets for a quick scenic walk into The Hollywood Bowl. You will feel like you are there, and you should be! You have a couple of months left to enjoy this festive L.A. summer destination that comes highly recommended by The 99 Cent Chef. It's all about the music at The Hollywood Bowl as my video featurette below will attest. It would be 2 hours long if I put in a 15 second clip of every concert I've enjoyed there. Everyone from New Waver's ABC (favorite lyric: "I've seen the future, I can't afford it") to Rufus Wainwright drag-channeling Judy Garland singing "Come on Get Happy" (nice gams Rufus)! The programmers for The Bowl come up with great theme nights all summer long, like the recent movie showing of Koyaanisqatsi with a soundtrack performed live by the Philip Glass Ensemble with the L.A. Philharmonic. So check out The Chef's own video musical medley featuring half a dozen 15-second favorites! Play it here. The video runs 4 minutes, 19 seconds. Do you have some favorite Hollywood Bowl picnic cuisine ideas to share, or a favorite show you attended? Do leave a comment. 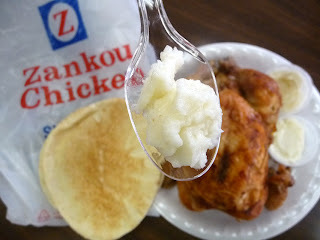 Zankou Chicken & The Hollywood Bowl video: Click here to embed or view video on youtube. Hollywood Bowl Medley video: Click here to embed or view video on youtube. A whole pineapple, chicken and India spices for around a dollar, plus a bbq grill, equals another 99 Cent Chef delicious budget entree. 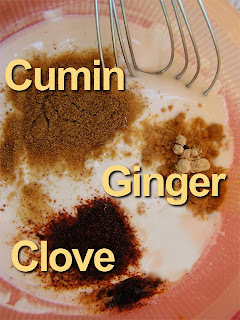 Looking through my spice rack and refrigerator yogurt selection turns up enough ingredients to almost make an India-style tandoori marinade -- although, short a few spices, it will still be tasty! No coriander or cardamon but plenty of cumin, ginger, clove and garlic powder; and no clay oven for baking tandoori chicken, but a barbecue grill will suffice. 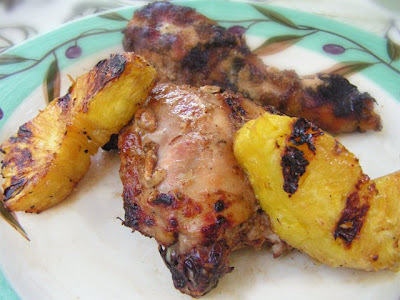 And pairing smoky spicy chicken with grilled sweet and tangy fresh pineapple on sale is a killer combination for a hot summer dish. The Chef tries to keep a full spice rack, but sometimes they get used up, or -- like India garam masala -- they're harder to find. Individual select India spices are easy to get on sale; you just need to make a mix. 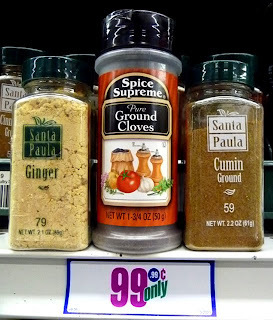 I've found powdered cumin, ginger, cloves and many other Middle Eastern spices at Latin markets, 99c only Stores and regular discount markets. I am lucky to have a few small India mom-and-pops close at hand in Culver City to make up the difference. If you have all the tandoori spices on hand, then go for it, but don't worry about leaving out a few, it will still taste great. Yogurt binds these spices together and you only need a small carton - I get the type with fruit on the bottom because it is usually on sale; just leave the fruit out. Coat the chicken pieces with the Chef's "almost tandoori" marinade and let it refrigerate covered for an hour or two, if possible. 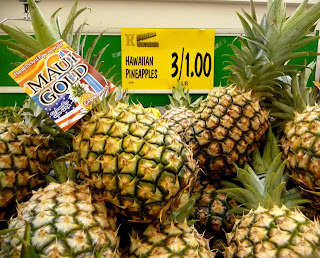 I was lucky to run across fresh pineapple at sale at 3 pounds for a dollar at my local Latin market and a whole pineapple for 99.99 cents at this 99c only Store. Fresh pineapple flavors are more intensely sweet and citrus sour -- grilling tones down the sour and increases the sweetness. Of course, regular canned sliced pineapple can be used; I have grilled it and it works fine. If you have any left over, make a breakfast smoothie the next day. Be sure to use up fresh pineapple quickly, as it turns brown in 24 hours (drizzle with lemon juice to prolong) compared to pasteurized canned. Pineapple generally cooks faster than chicken, so I add it later when one side of the chicken is brown. A ripe pineapple is not all green; it should be turning yellow, but not brown and soft. Peeling a whole pineapple is messy, but worth it. Just chop off the top and bottom and slice off the skin as you would an apple -- cut deep enough to remove all the tough scales. Lastly, half the pineapple lengthwise to slice out the tough core. The core is like fresh-peeled sugar cane and a sweet chew! The Chef's Almost Tandoori Chicken & Pineapple recipe can be converted into a shish kabob: just cut ingredients into smaller pieces -- try adding slices of yellow/red bell pepper and onion, too. You can also bake this entree in a regular oven (about 45 minutes at 350 degrees). *Please note that The Chef used budget ingredients from 4 different stores! 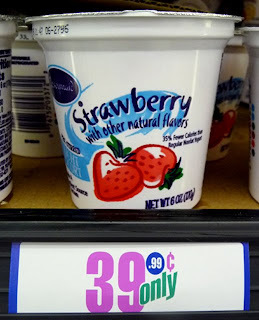 Pick up your discount foodstuffs when you see them on sale and store it! Mix and match whatever Indian style spices you have on hand - it will taste delish! Other tandoori spices include: teaspoon each of ground cardamom, coriander, garam masala and cinnamon. Mix tandoori ingredients into yogurt (leave out fruit on the bottom}. Coat 4 pieces of chicken and allow to marinate covered in the refrigerator an hour or two. 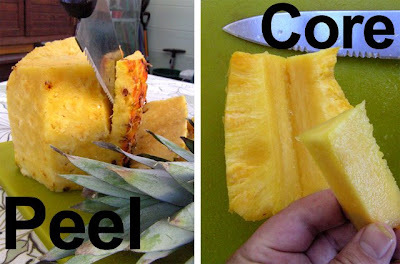 Prepare pineapple by cutting into large slices for grilling. 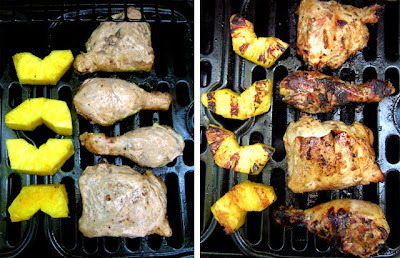 Heat grill and brown chicken on one side then add pineapple to grill. Check on pineapple often as it will brown faster because of its high sugar content. Add extra marinade to chicken during grilling. Chicken is done when juices run clear when pierced in thickest part. I had chicken pieces with both skin-on and off - both taste delish. My gas grill cooked chicken in about 20-30 minutes on low heat.